De-la-Fuente-Valentín, L., Pardo, A., López, F., & Burgos, D. (2015). 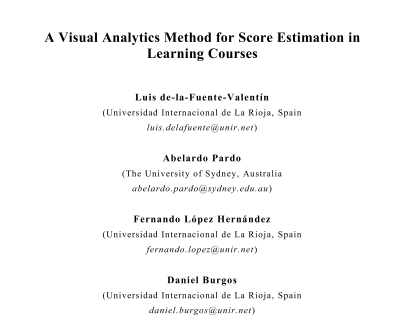 A Visual Analytics Method for Score Estimation in Learning Courses. Journal of Universal Computer Science, 21(1), 134–155. The provision of awareness is a well-known method for fostering students’ self-reflection, a metacognitive skill often related to academic success and considered one of the key skills of the 21st century. Although the information discovered using learning analytics techniques can be useful in fostering self-reflection, its delivery to students should be done without distracting them from their learning goals. This paper presents a visualization technique based on similarity measures and their relationship with final course results, in order to foster students’ awareness. The approach is based on the idea that ‘students that behave similarly are graded similarly’. This idea is validated with an empirical evaluation to determine the visualization technique’s accuracy when used to find a relationship between similarity and grade. The study used a previously collected dataset and several volunteers were asked to estimate the students’ scores with graphics provided as the only source of information. 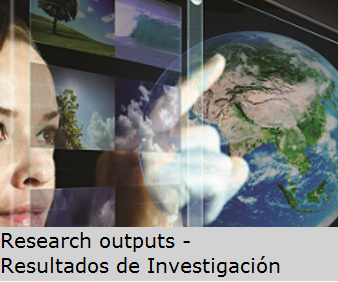 The obtained results validate the proposal as a means to foster effective self-reflection.